Wrapping up this series of Walt Disney World blog posts, I'm actually sharing one of my favorites today. 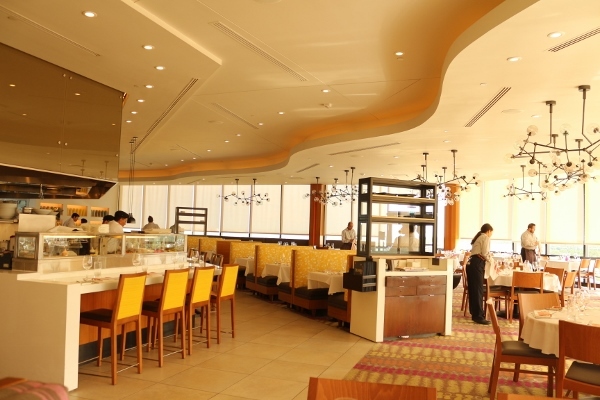 Perched atop Disney's Contemporary Resort is the elegant California Grill. I reviewed it a year ago, and am very happy to have the opportunity to discuss it once again. This beautiful, chic space features delicious flavors from the Pacific coast while boasting some of the best views around. California Grill is one of the prime spots on property for viewing Wishes, the fireworks spectacular at the Magic Kingdom. 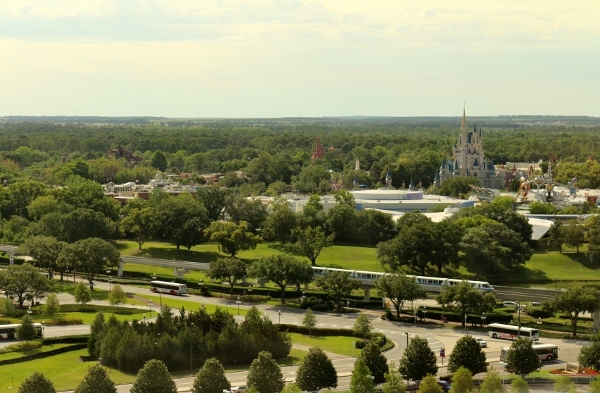 It also has great views of the nearby resorts including the Grand Floridian, the Polynesian, and the Wilderness Lodge. Epcot's also visible in the distance. 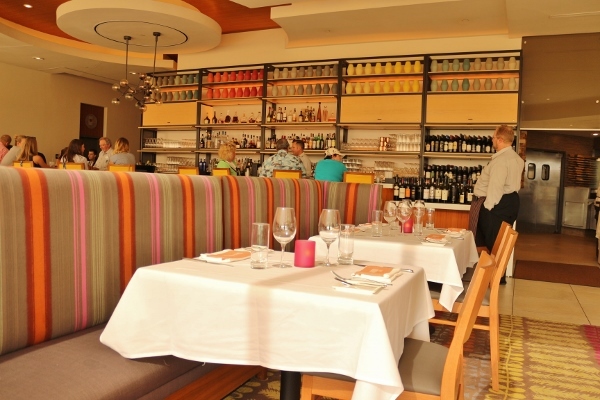 California Grill is another Signature Dining spot, using up two table service credits if you're on the Disney Dining Plan. 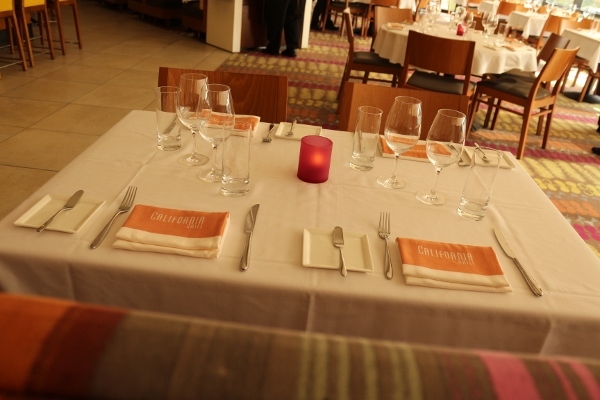 The prices do reflect that, but the quality of the food and service will definitely not disappoint. We started our meal with a cocktail. The Tropical Fruit Margarita features Patron Silver Tequila, and Cointreau Noir with tropical fruit puree, in this case passion fruit. It's so light and refreshing! 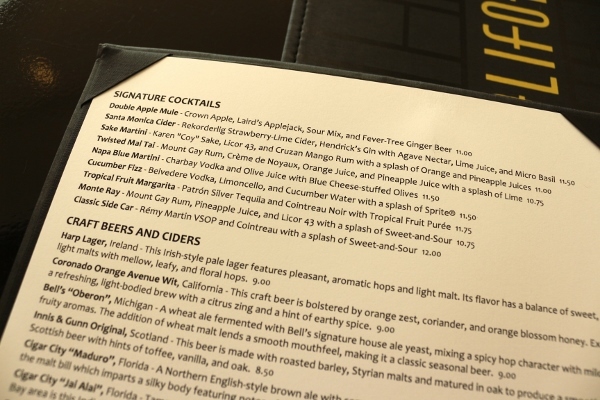 It doesn't have the harshness of a really strong margarita (that's the Patron for you!). It's definitely one of the tastiest margaritas I've had, and really reflects that bright, sunny California feeling one should have when dining here. 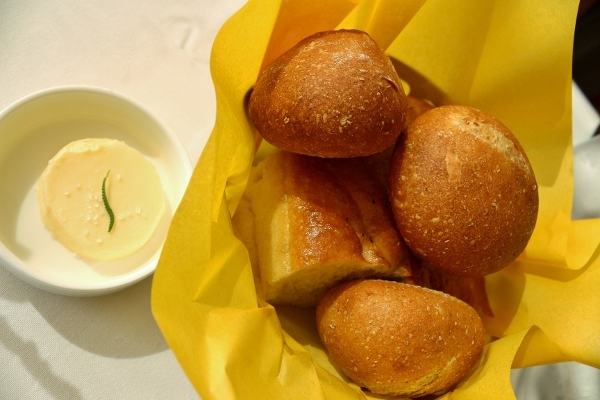 Bread service includes Whole Wheat Sourdough Rolls and Lavender Fococcia with soft butter. Both breads are freshly baked and very delicious. I'm a sucker for a good bread and butter combo. 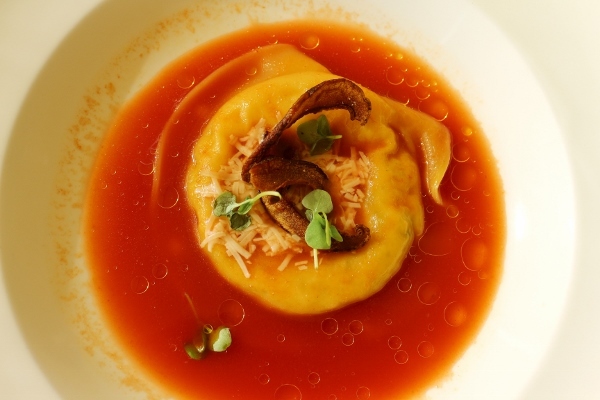 This gorgeous raviolo is filled with two kinds of goat cheese, and then sits in a lovely tomato-fennel broth. It's topped with crispy mushrooms, tiny basil, and is finished with a drizzle of Arbequina organic olive oil. It is absolute heaven in your mouth and is 100% worth the $15 price tag. Again, TRUST ME on this. For our entrees my sister and I actually did a little surf and turf again, but this time she was the surf and I was the turf. She was enraptured by the Seafood Ramen option, which includes lobster, Gulf shrimp, scallops, house-made ramen, and crisp vegetables in a fragrant broth. The broth itself is slightly spicy and reminiscent of a miso soup (probably dashi based), but with way more flavor. 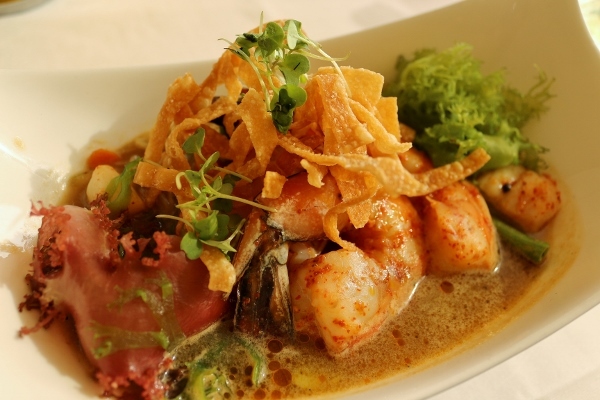 The delicate seafood, as expected, is all cooked to perfection. My sister was a very happy girl! 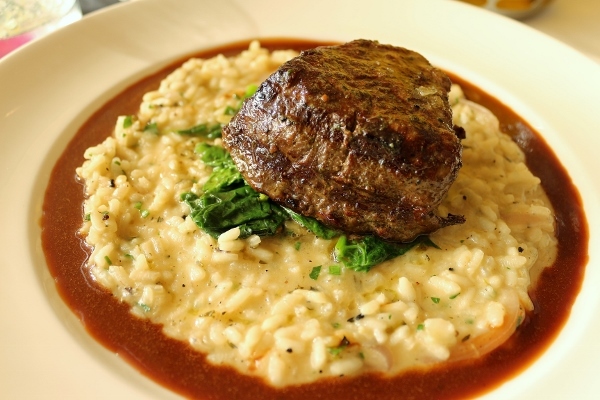 My choice was the Oak-Fired Filet of Beef, cooked to a perfect medium-rare, and served atop a black truffle, Gruyere, and caramelized red onion risotto, wilted ice root spinach, and finished with a tawny port wine emulsion. You may recall that I also ordered the Oak-Fired Filet of Beef on my previous visit, but last time it was prepared in a completely different way, focusing on tomatoes as the highlighted ingredient. I absolutely love both preparations, although they are vastly different. 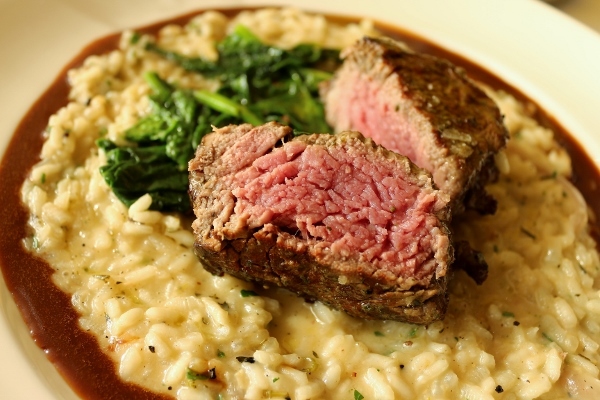 This particular risotto is silky with a very mild truffle flavor, and not too cheesy. The port wine emulsion is out-of-this-world-good, and definitely the most assertive component on the plate. It wonderfully compliments the exceptional meat. 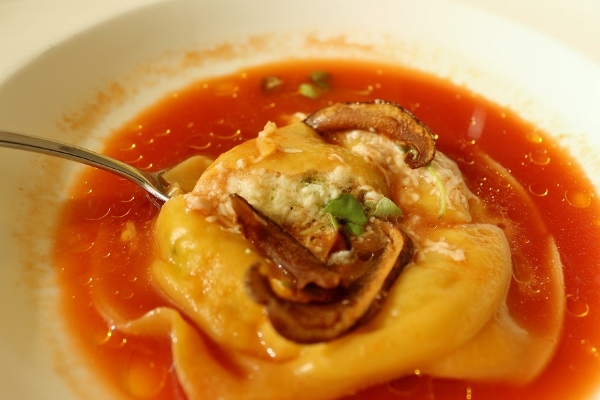 This dish is literally the perfect balance of everything. Definite love. You really can't go wrong here. By this point we had finished our cocktails, and asked our awesome server (I believe his name was Taz) for a recommendation for our second cocktail. He said he would bring us one of his favorites, but it would be a surprise. He arrived shortly afterwards with two beautiful Sake Martinis. A blend of Karen "Coy" Sake, Licor 43, and Cruzan Mango Rum with a splash of orange and pineapple juices. This is a cocktail that I would not have normally thought to order, however, it is exquisite! It's not too sweet, with light floral notes. 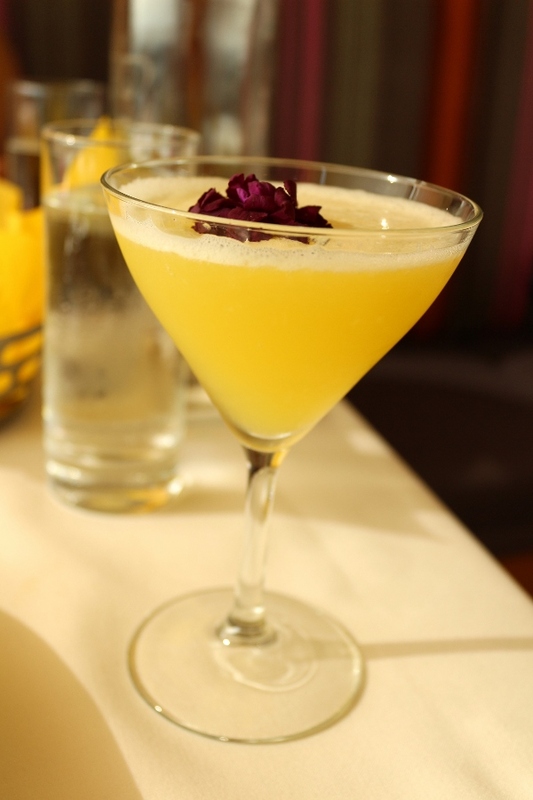 Although vastly different from the Tropical Fruit Margarita, it's refreshing in its own way. A very fortunate surprise indeed! 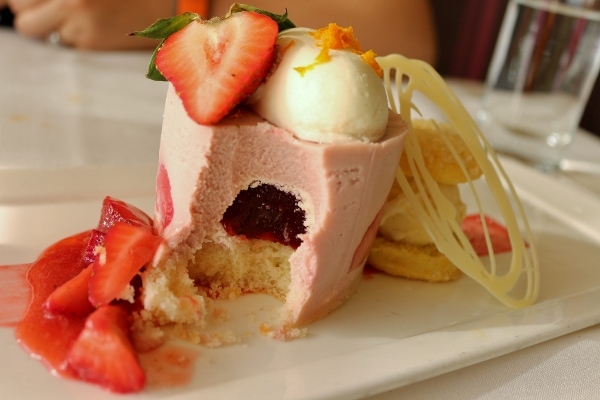 For dessert we selected the Plant City Strawberry Shortcake, featuring strawberry mousse, Bavarian cream, strawberry compote, and a tiny orange scone with vanilla ice cream. 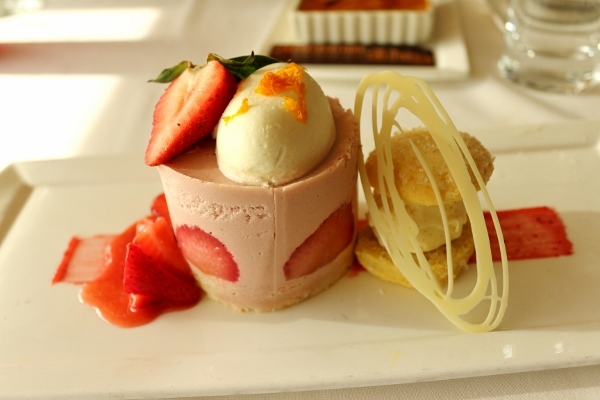 This is a beautiful presentation for a refreshing dessert. Although there's probably a whole lot of gelatin holding it together, it's an elegant rendition of a classic dessert. There's even a surprise strawberry filling inside the cylinder. 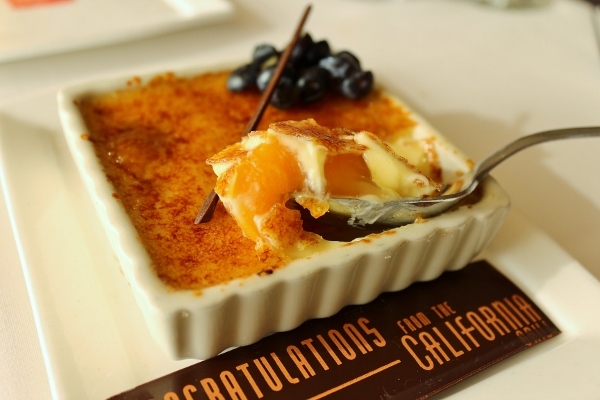 Since this was a belated birthday celebration, we also received the lovely Peaches and Cream Crème Brûlée to try. Rich sweet cream custard cloaks a chunky peach compote, and is finished with caramelized turbinado sugar. This is perhaps the best crème brûlée I've ever had because I absolutely love the inclusion of the peaches. It really lightens up what is typically a very rich dessert. 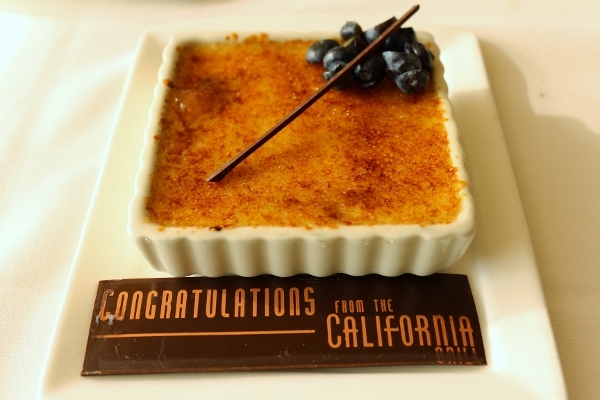 We actually prefer this crème brûlée to the strawberry shortcake. 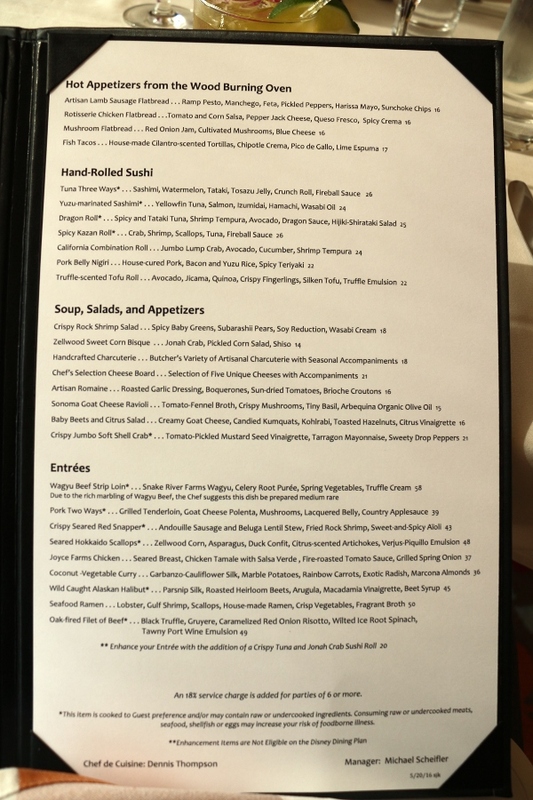 California Grill is always a special experience. I've never had a single complaint here. 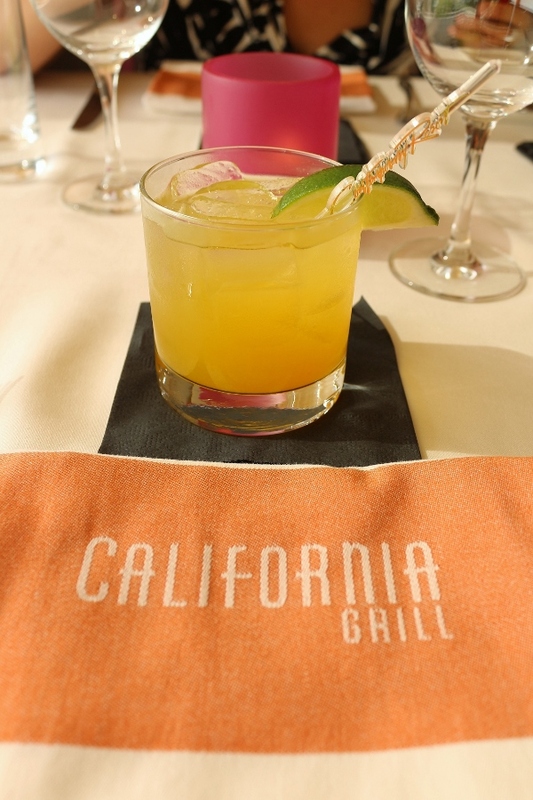 From the stellar service, the bright and colorful decor, the excellent craft cocktails, and the perfectly executed food time and time again, it's easy to understand why we keep returning to California Grill. Walt Disney World: Polynesian "Bar Crawl"